Bottom line: If you have always wanted a dog, but balked at the thought of picking up poop, then Aibo might be your perfect companion. No baths. No walking. No feeding. No picking up after. No vet bills. It's the perfect pet. Sure it costs almost $3,000, but stretch that out over a real pet's lifetime and it's a bargain. Today Sony announced that it is bringing its AI-powered robot dog Aibo to the US. The bot, which was initially released in 1999, is now in its sixth generation and has come a long way since then. The company reintroduced the faux pet last November exclusively in Japan. Although the price point seemed exceedingly high, it must have sold well enough that Sony figured that it would give it a go in the States. The price for the cyber-pup has not gone down. On the contrary, the US version will cost considerably more. In Japan, Aibo retailed for $1,740 plus required a $24 per month subscription to Sony’s AI Cloud service. Customers could get three years of service pre-paid for $790. So $2,530 for the pet and three years of service. Stateside Sony will be bundling three years of service with Aibo and selling it for $2,899 — an almost $400 up-charge. To be fair though, it does come with the Aibone (an interactive toy ball), paw pads, and a charging station. All those accessories except for the charging station were sold separately in the Japanese release. 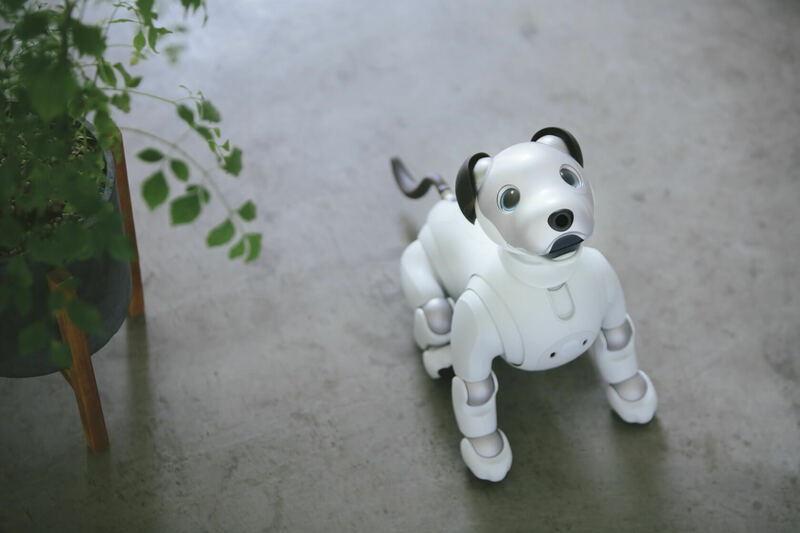 Sony’s AI Cloud service drives Aibo's artificial intelligence. The dog communicates with servers via WiFi or LTE (provided by AT&T). Communications include the toy’s daily activities and how you interact with it. This shapes the personality of the mechanical pooch. Sony claims no two Aibo’s will act the same. "No two Aibo companion robots are the same. Each owner's approach to raising their Aibo shapes its personality, behavior and knowledge, creating a unique environment for growth. In fact, Aibo is able to learn new tricks through owners' interactions, experiences with changing seasons and different events. Not content to sit and wait to be beckoned, Aibo will actively seek out its owners and can recognize their faces. It can also detect words of praise and smiles, as well as react to being petted or scratched on the head." The puppy can navigate to its charging pad independently, which is kind of cool. It can also recognize different family members and even live pets using facial recognition, which is also kind of cool but also a little bit creepy. Users can teach it tricks through a companion phone app and have it execute those skills through voice commands. Sony said that Aibo is going to be a limited release, but did not mention how many would be available. Even at the high price, I have a feeling that this is going to be one of those items that get snatched up quickly. Sony is hoping to have it out by the 2018 holiday season, so pre-orders should be going up soon.